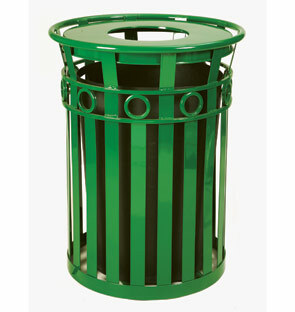 The Decorative Oakley Trash Receptacle Collection features decorative accents on durable slatted steel to set this receptacle ahead others of its kind. Designed with utility and attention to detail in mind, this litter receptacle complements any environment and will withstand years of usage. Excellent for universities, municipalities, and office complexes, these receptacles come standard with a durable 40 gallon liner and anchor kit included. The built-in leveling feet ensure balance and stability on both straight and slightly angled surfaces. Matching planters, benches, and cigarette receptacles are also available to create entire street scapes. Models available in the color options shown below. Models available with your choice of four different lids shown below, and single lids can also be purchased separately in the Accessories section. 40 Gal. plastic liner & Anchor Kit included. Available with four lid options.